My mom stopped over yesterday to check out the progress of the carport/porch tear down. We got talking and she mentioned that a few people have commented to her about how my house is always so neat and clean. We both kind of laughed (only if they knew) and I realized that I haven't really shared our house in its normal everyday state. I aim to be completely honest on this blog, so here you go. Here's my house as of 10:00 yesterday morning, just after I dropped my son off at preschool. No cropping, no editing pictures, it is what it is. If my son were home the floor would be covered in trucks and trains. As much as I would like our house to be spotless and put together, that's just not real life. I work outside of the house 4 days a week, I have two small kids, 2 animals that shed and housework that keeps piling up. There is usually laundry in the living room that needs to be put away and dust balls of dog hair on the floor. It's a pretty good chance if you stop by my house you will find a few piles. You know what I'm talking about. The school papers, mail, kids birthday party favors, magazines, books and random "trash" that your kids won't let you throw away. The things that you don't know what to do with that all end up in one spot on a table, floor, counter or in this case an ottoman. 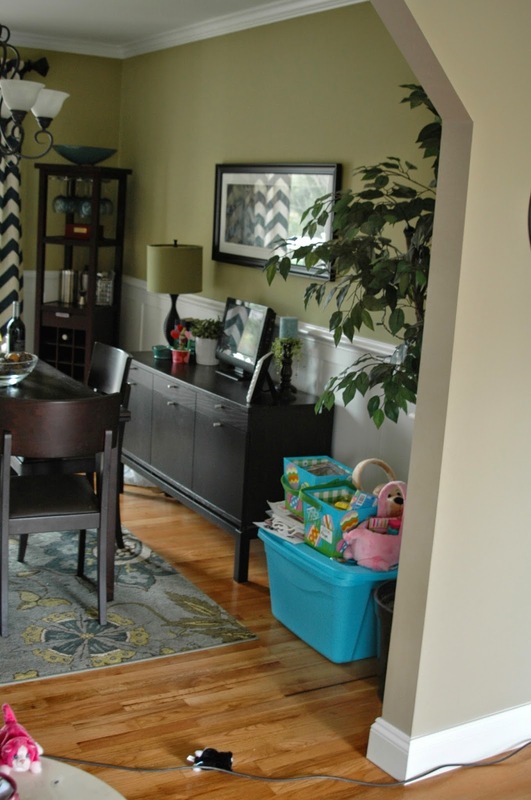 Who doesn't keep an Easter storage box and baskets in their dining room? I guess I better get on putting those away. 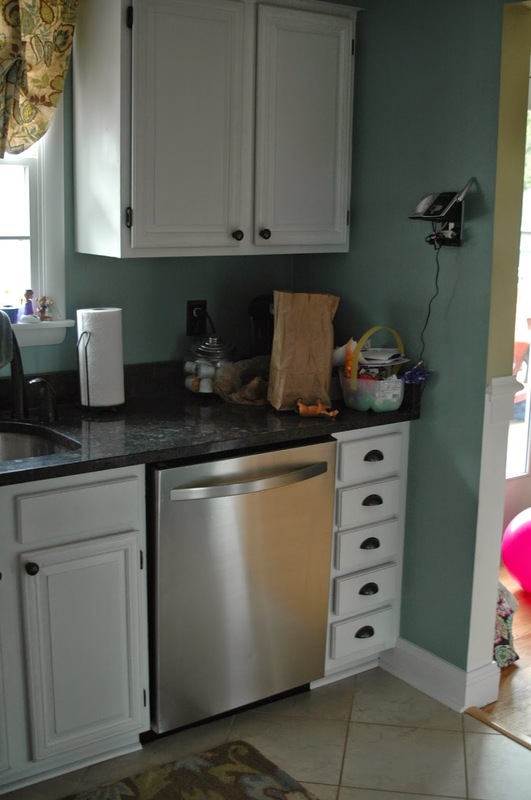 You'll also notice the vacuum cord that is ALWAYS out. The kitchen is the drop zone for everything. There is usually a pile near the phone and the other counter gets full of "junk" and things that need to be taken back down to the basement. 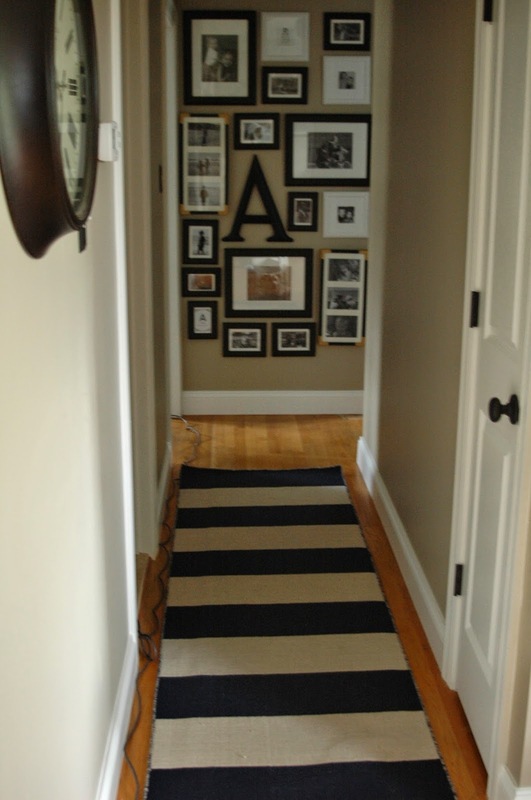 The hallway looks good, but there's that vacuum cord again. but when you look at her dresser that's a different story. 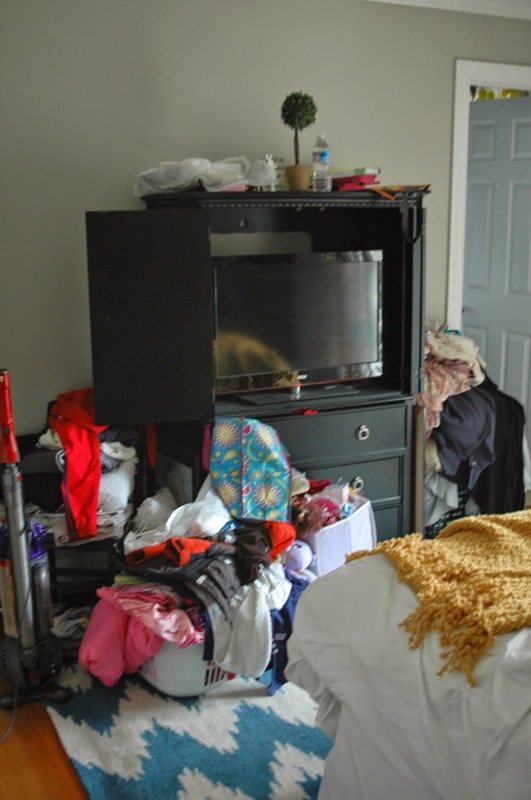 The clothes on her dresser need to be put away and her and Owen's laundry is piling up. In my defense, all our free time in the past week or so have been spent outside looking for our cat. Now that we found him it's time to get caught up on laundry. 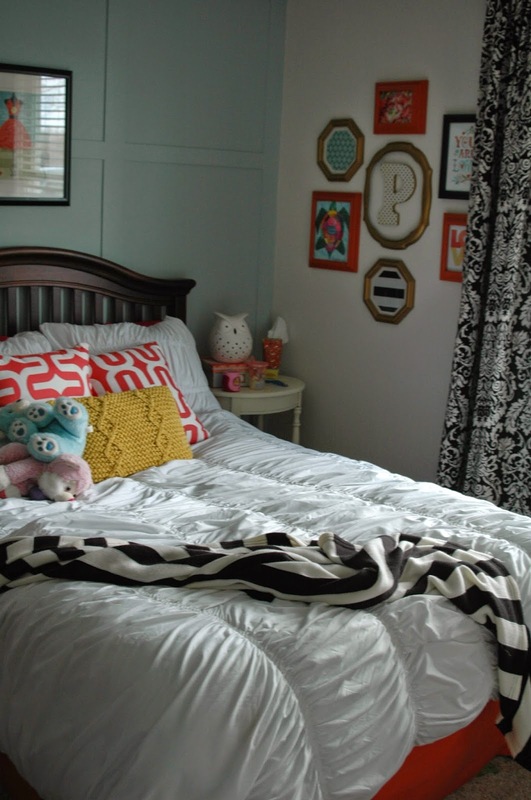 I usually make my bed as soon as I get up in the morning and before I leave for work. I didn't have to work today, so as of 10:00 my bed still wasn't made. I guess I tend to move a little slower on non working days. Our bedroom is where most of the spare accessories end up when I'm in the middle of redecorating a room. Wow, seeing this picture makes me cringe! Please tell me I'm not alone! Most of the stuff in the basket are my daughter's dolls and bins that were in her EXPEDIT book shelf, which was in her room until I built her bookshelves. I plan to move the bookshelf to the basement, but haven't gotten that far yet. There's also more clothes that are piled up from my laundry strike (AKA Simon search). In my defense, this morning I did scrub my stainless sink with baking soda, wiped down the fronts of my stainless appliances, threw in a load of laundry, vacuumed and got two kids out of the house and ready for school. So, I wasn't a total slacker. I'm just a normal everyday mom trying to keep things together and juggle 100 things at once. The house doesn't have to be spotless as long as everyone is happy and healthy. You can see my "neat" house tour here!